Paragon Promotional Bags is an industry leader that has been producing high quality custom bags for over ten years. With this decade of experience, we know our way around this expansive and ever-evolving industry. Our promotional bag experts will help you to select the best bag for your needs. We make what is often a confusing and overwhelming dilemma an easy, exciting and even fun process. We can help you select the material, color, and design to create the perfect promotional bag. We want your promotional bag to stand out from the rest and make a statement for your brand. Using only state-of-the-art equipment, your bag is guaranteed to be of the highest quality with fast production times to meet even the tightest of deadlines! We understand that looking at a picture on the web is a lot different than having a product in your hands. That’s why we offer FREE samples of all our promotional bags for you to see, feel and test-drive the real thing before ordering. When you’re ready to put your own logo or design on a promotional bag, our artwork designers will send you a virtual proof for you to see exactly what your bag will look like. 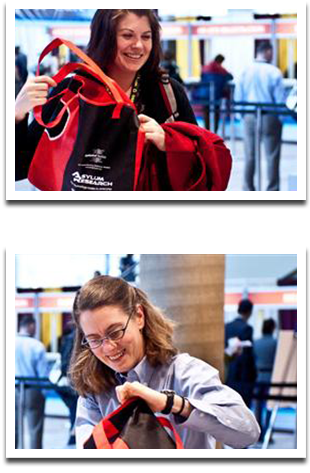 Once you love it, we will be on our way to make sure your promotional bags are in your hands when you need them. If you have any questions about Paragon Promotional Bags, dial us up at 800-603-0042 or email us at info@promotionalbagsinc.com and you will hear from us right away.